Need money quick? 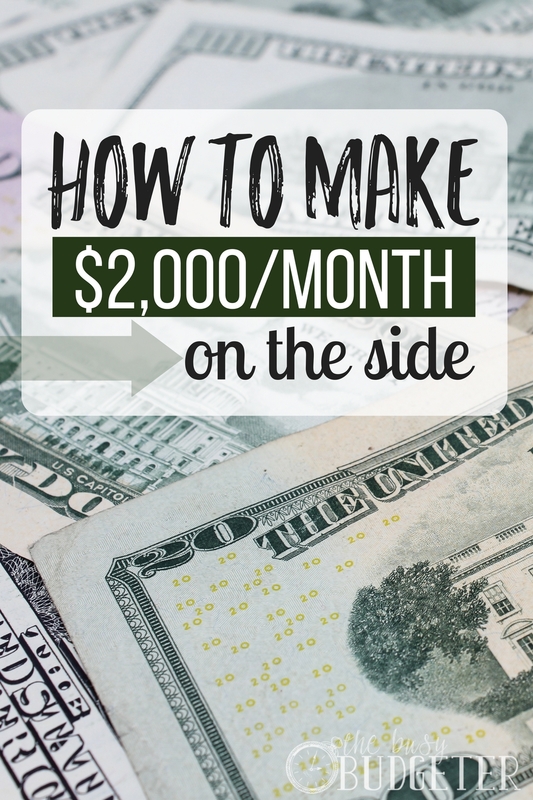 Check out these surefire ways to make $2,000 a month. 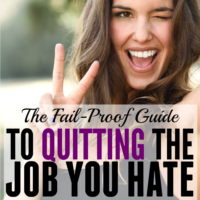 When I decided to leave my job and work from home, it was scary. Like, big time scary. It wasn’t that I was unsure of what I was doing, exactly. I knew it would work out somehow, but I have to admit, there were definitely moments when I wasn’t so sure HOW it was going to work out. After all, a regular ol’ jobby-job is reliable, right? I mean, yes, you could get laid off or fired, or the company could go under (all legit concerns, of course), but for the most part, you show up, do your job and someone else worries about how to pay you. Being your own boss, making money from home—it’s different. It can feel a little less certain. When I first started out working at home, my goal was to make between $2,000-$3,000 per month. That number was based on how much we could save by not paying for childcare and cutting back on a few bills, while still living comfortably and making ends meet. I faced a giant question: How am I ever going to do this?? After all, making money is hard, right? Truth be told, making money can be hard. We’ve all struggled to earn enough and we’ve all had jobs that didn’t fulfill us but paid the bills. But I’ve gotta be honest… compared to the way I used to earn money (at a 9-5 job), earning money on the side is MUCH easier. I’ve tried to always be transparent when I talk about our budget and how we pay our bills. As many of you know from my monthly income reports, my blogging business is doing well. But it did take time to get this far, plus a solid strategy to actually make money doing it. Now, it’s become the most rewarding and fulfilling job I’ve ever had. However, on my path to becoming a full-time blogger, I tried a bunch of other ways to earn money from home. Some were more lucrative than others, but I did make quite a bit of money—and sometimes quite quickly. Here are some work-at-home options I’ve tried (and yes, I do talk about blogging in this post, too—so definitely check that out toward the end)! Perfect for: If you stay at home. When I’d just started working from home, I didn’t think, “I’m going to create a super-successful blog.” I didn’t know that was a thing, so instead, I thought of what sorts of skills and experience I already had. I knew I could watch other children from my home and make a good, solid paycheck, so that was the first job I took on. I was already watching my own kiddo, so it was fairly easy to handle additional little people at my house. I spent $10 on this great resource: Start & Run Your Own Home Daycare, which was absolutely worth the “investment.” Daycare was great for my son, as he made plenty of friends to play with. Personally, I just love babies, so for me, it was fun and rewarding. Plus, I knew I was providing a great service to other moms who wanted someone reliable to watch their little ones while they were at work. Perfect for: Earning money on the side or for a stay at home mom. I also took on the job of mystery shopper through TrendSource and became a user tester through UserTesting. Between those two easy jobs, I made a little under $200 per month to supplement the $2,400 I was making by watching three children from my home in addition to my son. Both jobs were fun, relatively easy and simple to do. There are quite a few similar jobs you can do from home. You can become a virtual assistant, do customer service phone work, or offer up your services on sites like Fiverr. You can also earn money by taking surveys and playing games online through InboxDollars or Swagbucks. All of these virtual jobs can earn you extra cash to fill the gap as you work from home. If you fancy yourself a pretty good writer, but don’t feel like tackling blogging on your own, consider freelance writing work, which can become a lucrative full-time gig. However, it can take a little effort to get started and you have to continuously hone your craft (and be able to stomach a little rejection). BUT, it can be well worth it, particularly if you have a way with words. Perfect for: Someone that wants to turn their hobby into a business. If you don’t love sitting at a computer, but you want to find ways to make ends meet from home, there’s plenty of active, hands-on jobs you can do to earn a living. Ask yourself what talent you have, and what you really love to do. If you adore pets (or have a few of your own), how about starting a pet-sitting or dog walking service? If you feel fulfilled by work with seniors, consider teaching classes at the local senior center, providing visits and homecare, offering to run errands, or providing meals to those in need. Check with your local senior center, or even your local churches, retirement homes, or city hall to advertise and find options. Artistic and crafty people might want to take on an Etsy business, selling crafts online. You could also consider teaching classes through your local recreation center, high school, or community education program. Perfect for: Someone who needs money quickly. If you’re looking for some fast cash for the next month or two, a great way to boost your income is by cleaning out, organizing your home and selling what you don’t need. In fact, when I went on an unpaid maternity leave, before I realized I was going to be working from home permanently, we did a massive home organization. Not only did we “nest” for our new little guy and set up a nice, clean, organized house, but we were also able to make $1,800 in a month simply by selling all the things we had on hand that we really didn’t need. We went through videogames, clothes that no longer fit, sports stuff we didn’t use anymore, handbags, jewelry, furniture and other “stuff.” When you look around your home, you’d be amazed at the huge amount of things you can accumulate that you really don’t need, want or use. It was a great way to declutter and a great way to generate some much needed money to close our budget gap. Win-win! To sell your items, consider all your options. Try Craigslist for large items, furniture, yard equipment and toys (basically anything you don’t want to have to ship). Valuables, collectables, games and fashion can bring in money from eBay. Sell your books on Amazon, and try used sports and gaming stores to sell your unwanted athletic equipment, videogames and other toys. Perfect for: Stay at home moms or anyone that loves thrifting. So, in the interest of full disclosure, I once sold jeans and brand-name clothing on eBay. I’d simply go to thrift stores, search for items with a higher resale value and post them with my eBay app. It wasn’t my favorite job, but I was able to make around $700 a month doing it. While it wasn’t for me, I know a number of people who LOVE and swear by making money this way. Even if you don’t want to make “selling stuff on eBay” a regular job, you can still keep your eyes open for finds at garage sales (or even on Craigslist and curbs) that you can pick up, refurbish and fix up to sell. If you enjoy recovering furniture, sanding and painting, this can be a really great way to give new life to items that might otherwise end up in the trash. You can even add creative flair and modern updates, making it a great crafty endeavor, if that’s what floats your boat. Saving the most lucrative for last, of course. To be honest, though, blogging didn’t start out as my highest paying at-home gig. It started as a super cheap hobby that made me money instead of costing me money. While others golfed, or went to the movies… I blogged. It was fun, and relaxing and I got to actually help people! If you love to write- I’ll tell you straight up, you should start a blog. It’s cheap, fun, and has the potential of making more money than any other job you can find. You can actually start a blog for only $3.49/month which as far as hobbies go is crazy cheap! I didn’t come into blogging with special training or a prolific amount of writing, website or programming experience. (Okay, I had ZERO programming/tech experience at all, to be honest). I just knew I wanted to make it work. I was honest in what I was writing about and I always tried to be up-front and genuine about my challenges, successes, and even my failures (…lookin’ at you, eBay business, you just were not fun!). One of the biggest things I’ve discovered along the way is how many valuable resources there are out there, so I could truly LEARN HOW from the REAL experiences of others. It started with Elite Blog Academy, which was amazing and worth every penny. I read and studied what other successful bloggers had done. I tried to figure out what I could do to boost my social media presence and reach my audience. 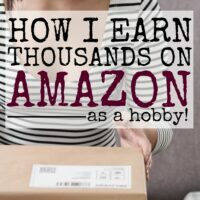 I’ve learned how to do affiliate marketing, boost my Pinterest strategy, and work with ad networks and sponsored posts. It’s been pretty darned explosive (and that might be an understatement). I’ve literally seen my blog grow exponentially right before my eyes. I grew from $18/month to over $20,000/month in 18 months. Yes, I certainly work at it, but I’m not a marketing genius or a tech guru. I’m just an ordinary mom who loves every minute of what I’m doing. I know blogging isn’t for everyone, but it has definitely been an amazing experience for me. So is it possible to bring in $2,000 in a month? Yes! I know it can seem daunting at first, and there will definitely be moments of frustration, fear and self-doubt—but if you try out some of these side hustle ideas, you can make it happen. If you don't have money to put into blogging before you start, the best free resource out there is a guide called The First 10 Steps to a Profitable Blog. Study it. highlight it. Make it your new best friend. What are some other ways you’ve found to make money from home? 2016 is the year where I started making over $2k / month from blogging. It has changed my life! And like last year, my goal is to at least double my blogging income next year. 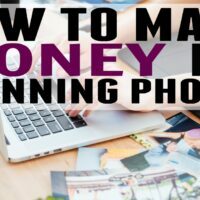 Blogging is amazing for making money!! I have been selling on/off on eBay for at least 15 years. I have sold clothing a few time but never strategically. Something to consider! My side hustle obsessions started years ago… more recently I’ve pretty much stuck to things like ebay, having yard sales and pet-sitting. However, I’ve never put the time, focus (and money) into anything like I have my blog so fingers crossed it becomes my most successful side hustle! Your journey is inspiring, thanks for being so transparent about the ups and downs! Lots of great ideas. I’m inspired to start helping seniors reorganize and downsize to their new space. This will fit my design and staging business. Thanks Rosemary for the encouragement! Great ideas! I’ve also taught music lessons, tutored elementary school students, and proofread and edited papers for college students. Every little bit helps! I am a former teacher so I try to substitute teach once a week. I am lucky to have grandparents who are willing to volunteer childcare so that I can do this. So I would say it is great for a SAHM who has childcare options every once in awhile. Many teachers say they would never go back and sub but honestly it is so easy and it is just one day! Once a week in our area can get you $350 a month. Your posts are really inspiring and so down to earth 🙂 thanks! I’ve just started my blog and your post about blogging and side income has been really great for motivation! 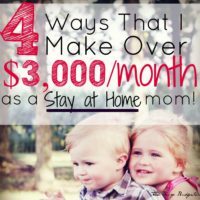 I love how you incorporated digital ways to make money as well as home based things like day care! I decided to stay home and be with my twins over two years ago and I love it! I’m a freelance writer, course creator and blogger! I’m trying my hand at affiliate marketing too! Thanks for these awesome tips! To make a little extra money, I do some freelance writing and virtual assistant work here and there, sell our clutter, take surveys and offers from sites such as Swagbucks, earn cash back through ebates, ibotta, and receipt hog. Lindsey recently posted…Mini USB Portable Essential Oil Diffuser for only $8.99 shipped! Thank you for sharing your experiences and be so transparent. I have been side hustling on eBay for over 5 years now and I make a minimum of 1,000 per month in extra income. Do you want to earn $220 in the next 60 minutes? How about $1,600 a day?